The next track in the program was the first Simple Minds track to bear a writing credit by the band’s current keyboardist Andy Gillespie. “Kiss + Fly” was an mid-tempo rocker with the by now eloquent Burchill guitar, heavy on the tremolo. The string patches were used here by Gillespie as if he were playing a Mellotron, featuring short repeated 1/8th notes. The long breakdown in the middle eight started out in a robust fashion, with Burchill’s surf chords washing over Mel Gaynor’s drum break, which sounded as if it had some backwards elements in it. The bridge lost me during it’s ill-advised second half, where shaker percussion predominates with the ghostly phasing of Jim Kerr’s vocals for an almost complete bleaching of the sound. It was never the strongest song in the program to begin with, but extending the bridge washed it out for my ears. Better was the title track. Eddy Duffy’s fuzzed bass gave this track more presence. When will Simple Minds learn that prominent bass is part of their sonic identity? Burchill’s guitar features yet more tremolo on the top of other effects to take it far from the guitar space. Gaynor holds it down with a straight forward drum pattern, light on the fills. The middle eight was completely instrumental here and also seemed dubbed out as did the one on the previous song, but not having vocals happening worked better for my ears. Jim Kerr returned to lightning, one of his pet metaphors for this song. His extended vocal breakdown in the long outro was a treat; sharing the spotlight with Burchill’s guitar in now straightforward prominence, minus the tremolo. Whenever I hear the introductory chords to “Blood Type O” I can’t help but shake the feeling that I’m getting ready to hear “Ja Guys,” the 12″ dub mix of Grace Jones’ “My Jamaican Guy.” Since Simple Minds are definitely fans, I can’t help but wonder if that didn’t percolate up from somewhere deep. This track was definitely Burchill’s time to shine with exotic instrumentation like dulcimer and Stylophone coming out of nowhere. The tough, slinky number may be the funkiest thing you might ever hear with dulcimer chords extending throughout much of its length. I had no idea he played dulcimer, but the Stylophone was definitely something new, since the late 60s instrument had returned to production in the new millennium and Burchill had [ostensibly] bought one for his sons. Producer Jez Coad subjected the monophonic Stylophone to a host of effects that fatten its sound admirably, with hints of distortion. This brief [3:49] number hews close to the first chapter in my rule book of this business called show: always leave them wanting more. I’m guessing that only the DL version of the album lacked this cut, but since “Graffiti Soul” is now “out of print” from all prominent US DL stores, I can’t check. But the song is as close as the band came to a folk tune with doubled acoustic picking right up front, shadowed by dirty electric, subdued in the mix predominating. The shimmering chorus effects that Burchill was so enamored with during the making of this album culminate in their apotheosis on “Shadows + Light.” It makes for a reasonable coda following the excellent closing number “This Is It.” It was dicey following such a strong closer with anything, but this worked well enough. The overall vibe to this album was very strong. Coad took the band to Rockfield so that they would record in a more integrated environment than they had done in decades. Whenever possible, more than one musician was on the floor to that something approaching a group dynamic could reveal itself during the recording. This was surprising to the band, who were used to recording everything piecemeal in the style of the late 70s. The full story of the recording of the album can be found here and it’s an eye opener, as it shows that the band were working for many years with the strength of an integral band approach having been lost up front at the recording of most of their albums. For years, I preferred the extreme eclecticism of “Cry” to this album, but heavy listening did reveal that the vibe on “Graffiti Soul” could inveigle its way to my heart, with me giving both albums an equal footing when compiling this Rock G.P.A. I wonder if Simple Minds could manage to negotiate the path between eclectic and unified by hitting all of the group’s strong points while passing up their weaknesses? It would take another six years before I would get the chance to find out. But not before Jim Kerr as well as the band, managed to shake up the Simple Minds paradigm with some surprising moves that left this fan’s head spinning in the interim. 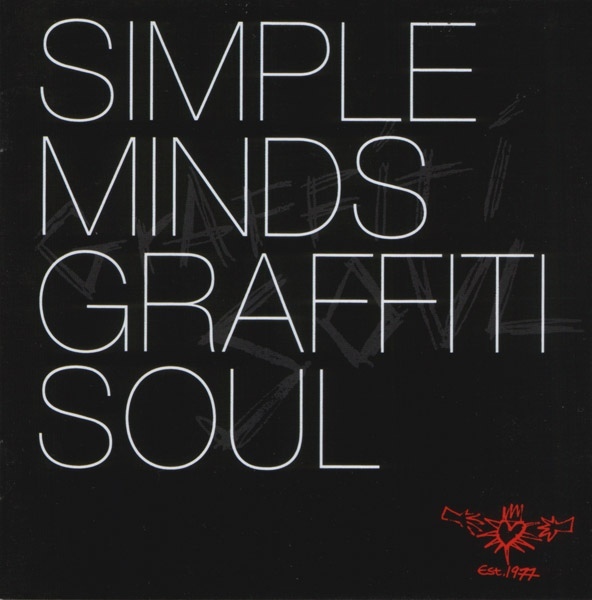 This entry was posted in Core Collection, Rock GPA, Scots Rock and tagged 2009, Graffiti Soul, Jez Coad, Rock G.P.A., Simple Minds. Bookmark the permalink. Kiss & Fly is really very memorable for my ears. No, it’s not the stand out track here, but on an album with little to criticize, I’m not at all negatively impacted by it. In fact, if this could have been the direction the band took after Sparkle In The Rain, I could have been well impressed. The title track is crunchy and the buzzy bass is as muscular as Gaynor’s drumming. But I’m most impressed by Burchill’s guitar throughout the track. Kerr plays with a few lyrical tricks he used back on Once Upon A Time – they have to be purposeful – When he intones “Footsteps” in almost the same voice as the opening of Wish You Were Here, it takes me aback, but then maybe in the back of his mind he knows how much better that track could have been 24 years earlier…Graffiti Soul is possibly their best title track since New Gold Dream. Blood Type O was the most difficult song on the album for me to initially relate to. To many post modern Bono vocal effects for my taste, but the harmonies on the chorus make up for it. With time, I’ve come to enjoy it. You are right monk the Stylophone and Dulcimer really give the song a 70’s vibe and the shuffle boogie reinforces that as well. That Blood Type O expires into the heavy “soul” of This Is It is briliant programming. Simple Minds save the albums anthem for the end and it works like so many percussion bombs to stop you dead in your tracks!! There’s something really special about This Is It. The glass shards of Burchill’s guitar recalling the glories of Sons And Fascination and New Gold Dream, Kerr’s cool, calm, confident vocal, a massively powerful rhythm section let loose to propel the track higher and higher – it’s a special song. Monk, I’ll give you that Shadow + Light works as a coda, kind of an unassuming one though. It just feels like a b-side to me. I choose to listen to Graffiti Soul without it when it’s on my iDevice. There’s something very Echo + The Bunnymen about the track as well. Burchill is playing from Will Sargent’s play book here – and that’s not at all a negative thing to say about it. I wonder if there was an attempt to create another Kick Inside Of Me / Shake Off The Ghosts moment as on Sparkle? Not a bad thing to attempt, I’m just not sure it worked. Solidly a 3.0 with the ability to be a 3.5. A very solid album. I concur with a 3 or 3.5. Burchill really picked up his game withe B&W050505 and Graffiti Soul. This is the sound of a confident band no longer struggling to find a sound.